Parents and Educators, support the foundation with your tax-deductible contributions. You can do that in two ways. Parents and teachers: Another way to donate to the Misty Foundation at no cost to you is using AmazonSmile. A portion of the price of all eligible products you buy on Amazon will be donated to the charity of your choice. Amazon supports over a million charities. In the box that says, “Or pick your own charitable organization” type: Misty of Chincoteague Foundation. 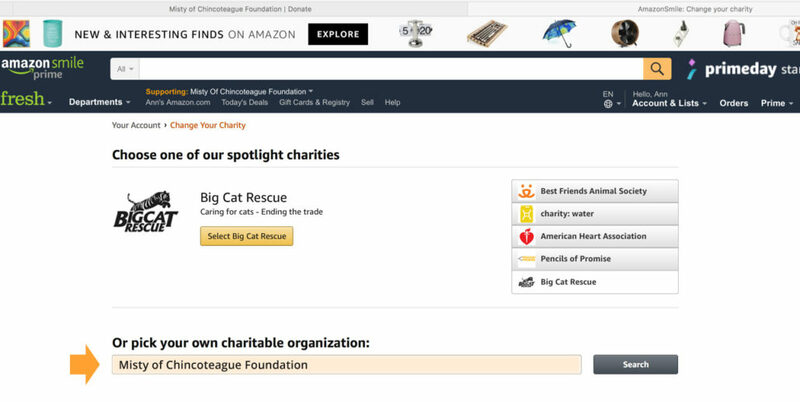 After you click “Search” you will see the Misty of Chincoteague Foundation as an option. Now a little bit of every purchase you make on AmazonSmile will be donated to The Misty of Chincoteague Foundation. Thank you! This web site was developed by the Misty of Chincoteague Foundation.